The Young Caymanian Leadership Foundation names four women and one man as finalists for the top spot in 2016’s annual awards ceremony. The Finalists are from various professions such as healthcare professionals, finance and business experts. The five were chosen from nominations put forth by the community consisting of young Caymanians between the ages of 20 and 35. A subcommittee comprising YCLA Alumni then embarked on an in-depth and extensive undertaking. Careful consideration was given to the information provided on the nomination form and each nominee was required to submit a recent resume for the selection process. After the careful and detailed evaluation, the five finalists for the 2016 YCLA were selected. Although there is no single defining factor that can be attributed to the role of a true leader, there are certain qualities that the Recipient of the YCLA must have. Those qualities include a strong social conscience, humility and the demonstrated ability to uphold the highest moral and ethical standards in his or her personal, professional and spiritual lives. Whilst the level of academic achievement is important, the demonstrated ability to serve as a role model and to be worthy of being so emulated by our young people has been a key factor in the selection process. It therefore follows that the level and nature of community involvement (whether by way of voluntary service or participation in local charitable or other service organizations) will undoubtedly be one of the deciding factors in the selection of this year’s Recipient of the 2016 Young Caymanian Leadership Award. 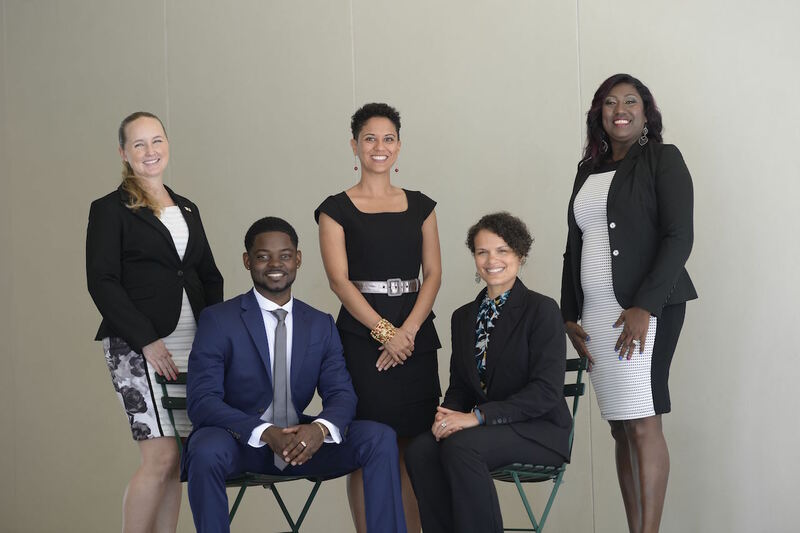 Dr. Alexandra Bodden, age 30, a Doctor of Psychology and educator at the University College of the Cayman Island; Dr. Kristina Maxwell (nee Bramwell), age 30, a Doctor of Physiotherapy at the Cayman Islands Hospital and local entrepreneur; Shena Ebanks, age 32, a human resource manager and specialist working at the Ministry of District Administration, Tourism and Development; Tedrick Green, age 28, an office manager with an accounting degree and local entrepreneur; Brianna Wilkerson (nee Ebanks), age 27, a CPA and local health and wellness entrepreneur. Psychopharmacology practicum student in 2012; now at Behavioral Health Associates Cayman since 2014 until present. She is also an adjunct lecturer at the University College of the Cayman Islands. Dr. Maxwell, the daughter of Lance Bramwell and Sharon Hall, was born and raised in West Bay, graduated from Triple C High School in 2003. She gained a Bachelor of Science in Athletic Training/Exercise Science with a minor in Health from Ithaca College New York in 2007, and a Doctorate in Physiotherapy from the University of Miami in 2010. She has been working as a physiotherapist at the Cayman Islands Hospital, and teaching spinning classes at Kings Sports Center. Her attention to the community also spurred her into becoming an entrepreneur starting a business called Essential Services Uniforms to provide healthcare uniforms. “Kristina is never satisfied with the status quo and is always seeking new ways to better herself professionally and personally. If she says she’s going to do something, you can consider it done. Any task that she sets out to accomplish she does and does it very well”, says her husband and nominator Damenian Maxwell. Mrs. Ebanks, daughter of Lezma Ebanks, was raised in West Bay, graduated from John Gray High School in 2001. She earned a Bachelor’s of Science in Business Administration from the University College of the Cayman Islands in 2009, and went on to gain her Master’s degree in Human Resource Management from the University College of the Cayman Islands in 2012 and is currently studying for a Senior Professional in Human Resources Certificate. She has been working as a human resources and freedom of information manager for the Ministry of District Administration, Tourism and Development. She is the current president of the Cayman Islands Society of Human Resource Professionals, an active member of the Society for Human Resource Management, Director on the Board of Governors for UCCI, and active with the Junior Achievement at John Gray High School and Sir John A. Cumber Primary PTA. “Her various skills and competency could only have been mastered by someone who is both helpful and willing to learn from others around her. Shena is someone who sees a need and fills the need. She can always be called on to be professional, ethical, responsible and humble”, says her nominator Mrs. Adonza Harrison. Mrs. Wilkerson, daughter of Joseph and Brendalee Ebanks, was born and raised in George Town, graduated from Triple C High School in 2007. She gained a Bachelor of Science in Accounting from the University of Tampa in 2011, a Master’s in Business Administration from University of Tampa in 2012, and exam qualified CPA from Georgia Public Accounting Board passing all exams her first time taking them in 2013. She works at PricewaterhouseCoopers in the Regional Finance Department, and presently enjoys working for herself using her Health Coaching Certification from the Institute for Integrative Nutrition at her health coaching and wellness business, Made Well. She is also a strong advocate on island for using natural solutions, such as essential oils, for one’s health. “As it is Brianna is a gifted leader and mentor. I see this the most in her role as volunteer staff with InterVarsity Christian Fellowship and now as the Treasurer for InterVarsity here in Cayman. For the past seven years she has devoted every ounce of herself to the growth and development of college students, particularly women”, says Tomy Wilkerson her loving husband and YCLA co-nominator. Mr. Green, son of Joyceann Seymour-Green and Patrick Green was born and raised in George Town. He graduated from the John Gray High School as the Head Boy in 2004. He earned a Bachelor’s of Arts degree in Accounting from the University College of the Cayman Islands. He is currently working on his Masters in International Business Administration from the business School of Nova Southeastern University with set completion in early 2017. He has been working as a manager at State Street Cayman Limited since 2012, while growing his own local perfume company, Ted Green Fragrances. He was the winner of the Young Entrepreneur of the Year Award 2015 for his business achievements. He is a member and active volunteer with the Kiwanis Club, as well as a founding member and the current Curator for the Cayman based Hub of the Global Shapers. “He has always struck me as the right balance of ‘humble’ and ‘go-getter,’ and it has always been evident to me that he is innately passionate about his community in organizations such as Global Shapers and Kiwanis, and does all that he can because he cares, and not for validation from the public”, says nominator and current YCLA Recipient Mrs. Kellie Sandy. Thanks to them, we are able to touch the lives of an ever-growing number of Cayman’s young people. We are so grateful for their support. Tickets for YCLA 2016 have sold out, but if you’d like to be waitlisted contact Tara@ycla.ky. The cost is $250 per person. Corporate tables of ten are also available for $2,500. The event is November 5, 2016 at the new Kimpton Seafire Resort and Spa. The theme is “Step Up and Step Out”, and the speaker is soon to be announced. Doors open for the reception at 6 pm. At 6:45, doors are closed to accommodate the live telecast. Doors re-open after the broadcast for the remainder of the evening to celebrate.